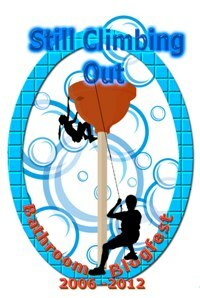 This year's event celebrates the theme "Still Climbing Out," building on last year's "Climbing Out" theme. Bathroom Blogfest takes place the last week in October - this year from Monday, October 29 through Friday, November 2, 2012. Bathroom Blogfest celebrates the customer experience across a wide range of perspectives, using the tools of social media. When we first started out, only blogs were involved. Since then, Bathroom Blogfest has expanded on the web via Bathroom Blogfest as well as Facebook with Bathroom Blogfest Fan Page and Twitter BathroomBlogfes via the hashtag #BathroomEXP. We anticipate the event expanding to Pinterest, too. I hope all of this is making you realize that you don't want to miss Bathroom Blogfest 2012! Click on Are You In For Bathroom Blogfest 2012? and fill out the form. Be ready to publish at least one blog article during Bathroom Blogfest week; include the logo and mention fellow Bathroom Blogfest participants. Like the Bathroom Blogfest Fan Page. Support the #BathroomEXP conversation on Twitter, Facebook, Blogs, LinkedIn, Pinterest and whereever else you share your passion for the customer experience. Visit the BathroomBlogfest.com blog for regular updates. We hope you in for Bathroom Blogfest 2012! P.S. : Please help us get the word out. Thank you.